Throughout my travels I’ve visited ruins, cathedrals and UNESCO World Heritage Sites. I’ve been humbled by volcanoes and euphoric from trying indigenous cuisine. However, there are times where I’m underwhelmed. Times when the expectations are so high that the reality has no way of measuring up. Unfortunately, this happened during my trip into the city of Sorrento. A decade later, (two decades) I finally saved enough money (it was a free trip) to travel to Italy. It was no coincidence (yes, actually it was) that Naples was among the regions I would be visiting and, therefore, would finally make it to magical Sorrento (I really wanted to go to the island of Capri instead.). 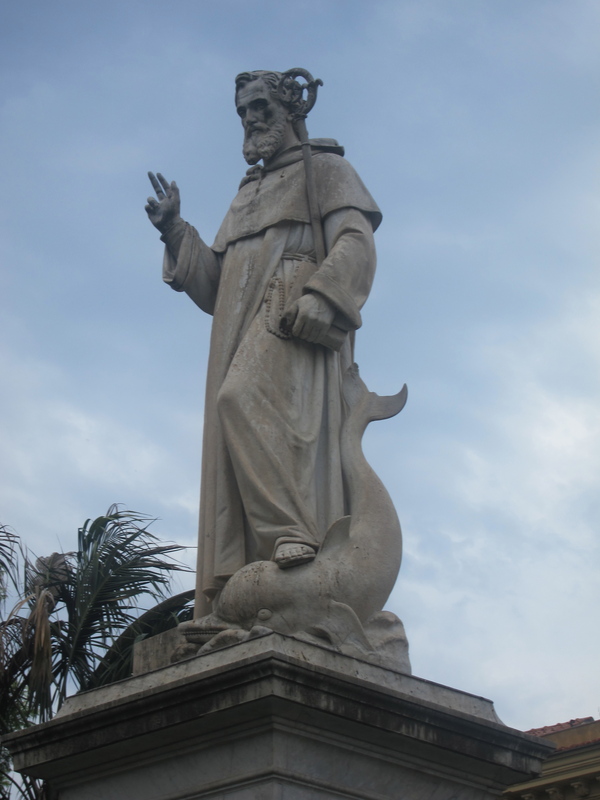 Only, before entering, I genuflected (ashed out my cigarette) before the statue of St. Antonio, patron saint of Sorrento, but by the time I got back on my feet and looked up I wished I had never paid respect to this horrible man. As a matter of fact, I wished I had never stepped foot in a town that allowed such a mean person be their patron saint. When I looked up at Antonio, I noticed he was stomping on a dolphin with his gross monk sandals. What did a poor, defenseless dolphin ever do to him? I mean, was Sorrento overrun by marine mammals? The “horror.” Was he really just stomping them out with his feet? Like roaches? Or, worse, was he responsible for casting tuna nets to get rid of them?